Layer is one of the main components of NextGIS Web software. Layer is a raster image or a vector file (table from database). To join layers on a map you need to set a style (or style set) to display a layer. Styles may be set only for vector layers. Interface for adding of PostGIS layers, vector and raster layers is practically the same. Firstly you provide layer parameters and then add a style. To add a raster layer navigate to a group where you want to create it. In actions pane “Create resource” click “Raster layer” (see Pic. 2.22.). Create resource dialog for raster layer will open and will look like Pic. 2.23.. Enter display name that will be visible in administrator interface and in map layer tree. Switch from “Resource” tab to “Raster layer” tab, which is presented on Pic. 2.24.. Here specify a coordinate system the raster will be reprojected to (by default there is only WGS84 / Pseudo Mercator (EPSG:3857)) and select a file. The file should be in GeoTIFF format with 3 or 4 bands (RGB or RGBA). After a file is successfully uploaded you need to create a style (if it was not create automatically). When creating a map (for more information see subsection Creation of web map) you can add a raster to a map by selecting a raster and its style. Most of utilities does not create alpha channel and only add a NoData value. To transform NoData value to alpha channel use a command line utility gdalwarp. Here is an example of this command. NextGIS Manager simplifies this process. Software has an option to upload a raster to NextGIS Web and cut using alpha channel. To add a vector layer navigate to a group where you want to create it. In actions pane “Create resource” click “Vector layer” (see Pic. 2.25.). Create resource dialog for vector layer will open and will look like Pic. 2.26..
Switch from “Resource” tab to “Vector layer tab”, which is presented on Pic. 2.27..
Windows-1251; also you need to specify encoding that is used for attributes: if encoding is not set ESRI Shapefile should have a file with encoding description (.cpg extension), in case of GeoJSON encoding is always UTF-8) and select source file. In case of ESRI Shapefile all components (dbf, shp, shx, prj and other files) should be compressed to a zip-archive. Shapefile should have UTF-8 or Windows-1251 encoding. If you upload data through web-interface, do not use EPSG:3857. Use EPSG:4326 or other coordinate systems (EPSG:3857 mentioned on Vector layer tab is a storage CRS not related to data CRS). Output file should not have invalid geometries (QGIS tool should output an empty list of invalid geometries), dates should not have NULL values, there should not be attribute names: id (ID), geom(GEOM). Special restriction for WFS protocol: attribute names should begin only with letter or (_), next allowed sybmols in name is letters, digits, (-), (_), (.). Coordinate system should be recognized by GDAL (output of gdalinfo should contain coordinate system definition). After a file is successfully uploaded you need to create a style. For more information about creation of styles see subsection Vector layer styles. When creating a map (for more information see subsection. Creation of web map) you can add a vector layer to a map by selecting its style. NextGIS Manager simplifies this process. Software has an option to upload of vector files in different formats to NextGIS Web without separate archiving. To add a vector layer from database PostgreSQL with PostGIS extension you need to create a resource PostGIS connection. It is enough to create one connection. In actions pane “Create resource” click “PostGIS connection” (see Pic. 2.28.). 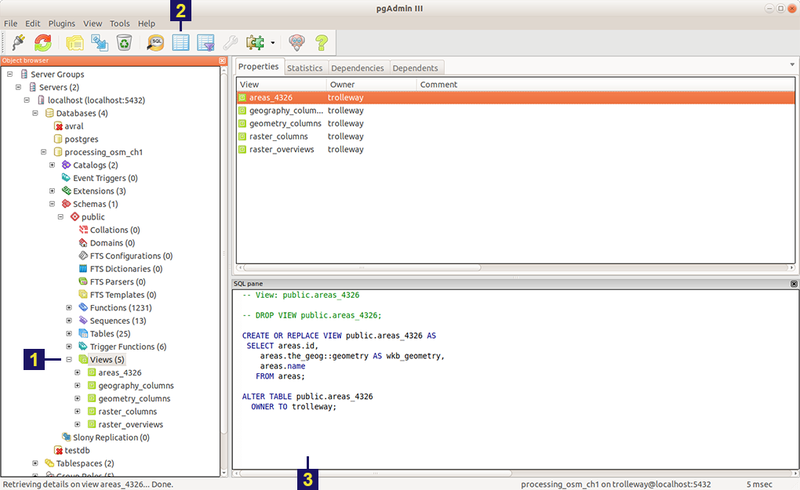 Create PostGIS connection dialog is shown on Pic. 2.29. Enter display name that will be visible in administrator interface. Do not confuse this name with a name of layers in a database. Switch from “Resource” to “PostGIS connection” tab, which is presented on Pic. 2.30.. Here enter PostGIS database connection parameters to connect data for display. Then you can add single PostGIS layers. Navigate to a group where you want create layers and in actions pane “Create resource” select “PostGIS layer” (see Pic. 2.31.). Create resource dialog for PostGIS layer is presented on Pic. 2.32. Switch from “Resource” tab to “PostGIS layer” tab, which is presented on Pic. 2.33..
From a dropdown list select a database connection (creation of a connection is described above). Enter a schema of a database where layer data is stored. Single database can store multiple schemas. Each schema contains tables and views. If there is only one schema its called public. For more information see PostgreSQL DBMS manual. Enter Table name (PostGIS layer). You need to know names of tables and columns in your database. Display of tables and views is not a feature of NextGIS Web. To view them you can use: NextGIS QGIS or PgAdmin software. Enter “ID column”. When data is loaded into PostGIS using :program: NextGIS QGIS software an ogc_fid column is created. If data was loaded in another way the name of column may be different. An ID column should follow rules for data type: the value type should be a number (numeric) and it should be a primary key. Enter “Geometry column” name (if data was loaded to PostGIS using NextGIS QGIS software usually a geometry column called wkb_geometry is created. If data is loaded in another way the name of column may be different). Parameters “Geometry type”, “Coordinate system”, “Attribute definitions” and “SRID” are not required so you can use default values. NextGIS Web software supports adding of tables with point, line and polygon geometries stored in a single geometry column. This is required for some specific datasets: e.g. if one table stores coordinates for parks as polygons and trash cans as points in a single table. In this case in NextGIS Web you need to add three different layers for each type of geometry and select appropriate geometry type in “Geometry type” parameter. After layer is created you need to set a label attribute to display labels. Navigate to layer edit dialog and set a checkbox for the required field in “Label attribute” column. If structure of a database has changed (column names, column types, number of columns, table names etc.) you need to update attribute definitions in layer properties. To perform changes select in actions pane :”Update” and then on “PostGIS layer” tab change “Attribute definitions” to “Reload” and click “Save”. You created a connection and trying to create a PostGIS layer based on it and getting errors. Cannot connect to the database! Check if the database is available, is it up, do you have right credentials? You can all these using pgAdmin or QGIS. Note that databases go up and down and credentials change. In NextGIS Web you can not define queries using a WHERE SQL expression. This provides additional security (prevention of SQL Injection attack). To provide query capability you need to create views with appropriate queries. Data schema where to create a view («Properties» tab). The numbers indicate: 1. – Database items tree; 2 – a button for table open (is active if a table is selected in tree); 3 – SQL query for view. After that you can display a view to check if query is correct without closing pgAdminIII (see item 2 in Pic. 2.34.). NextGIS Web is a WMS client. To connect a WMS layer you need to know its address. WMS server should be able to serve it using a coordinate system EPSG:3857. You can check for this coordinate system presence by making a GetCapabilites request to a server and examining the response. For example a WMS layer provided by Geofabrik (GetCapabilities), responds in EPSG:4326 and EPSG:900913. While EPSG:900913 and EPSG:3857 are technically the same, NGW requests data in 3857 and server does not support for that coordinate system. To add WMS layer you need to create a resource called WMS connection. You may create a single connection for many layers. In actions pane “Create resource” click “WMS connection” (see Pic. 2.35.). Create resource dialog for WMS connection is presented on Pic. 2.36..
Switch from “Resource” tab to “WMS connection” tab, which is presented on Pic. 2.37.. Here enter WMS server connection parameters from which you want to display data. Then you can add single WMS layers. Navigate to a group where you want create WMS layers and in actions pane “Create resource” select “WMS layer” (see Pic. 2.38.). Create resource dialog for WMS layer is presented Pic. 2.39..
Switch from “Resource” tab to “WMS” tab, which is presented on Pic. 2.40.. Select WMS connection that was created earlier. Select coordinate system which to use for requests to WMS server (by default there are only WGS84 / Pseudo Mercator (EPSG:3857) ). If parameters are correct the parameter “Format” will display MIME-types list that are served by a server. Select an appropriate one. If parameters are correct the parameter “WMS layers” will display a list of layers that are server by a server. Select required layers by clicking underlined names. You can select several layers. Identification requests to external WMS layers from Web maps are not supported yet. NextGIS Web software could perform as WMS server. This protocol is used to provide images for requested extent. To deploy a WMS service you need to add a resource. To do it in actions pane “Create resource” click “WMS service” (see Pic. 2.41.). Create resource dialog for WMS service is presented on Pic. 2.42..
Switch from “Resource” tab to “WMS service” tab, which is presented on Pic. 2.43.. Here add links to styles of required layers to a list (see (see Pic. 2.43.) For each added style you should set a unique key. You can copy it from the name. After a resource is created you will see a message with WMS service URL which you can use in other software, e.g. NextGIS QGIS or JOSM. Then you need to set access permissions for WMS service (see section Setting permissions). NextGIS Web layer could be added to desktop, mobile and web gis in different ways. Single NextGIS Web layers could be added as WMS. To use them through GDAL utilities you need to create an XML file for required layer. You need to know an URL for WMS service to create that file. Enter these parameters to ServerUrl string in example below. The rest remains unchanged. Single layers of NextGIS Web could be added as TMS. Create an XML file for required layer. To create this file you need the information about NGW address and a layer number (in the example: address - http://demo.nextgis.ru/ngw_kl, layer number - 5). Enter these parameters to ServerUrl string in example below. The rest remains unchanged. WFS layer setup is performed the same way as for WMS service but you add a layer instead of a style. NextGIS Web can act as WFS server. Third party software could edit vector data on server using this protocol. To deploy a WFS service you need to add a resource. To do it in actions pane “Create resource” click “WFS service” (see Pic. 2.44.). Create resource dialog for WFS service is presented on Pic. 2.45..
Switch from “Resource” tab to “WFS service” tab, which is presented on Pic. 2.46.. Here add links to styles of required layers to a list (see Pic. 2.46..) For each added style you should set a unique key. You can copy it from the name. For each layer you can set a limit for the number of features transfered at once. By default the value is 1000. If this parameter is empty the limit will be disable and all features will be trasfered to the client. But this could result in high load of a server and cause significant timeouts because of high volumes of transfered data. After a resource is created you need to open it in administrator interface one more time. You will see a message with WFS service URL which you can use in other software, for example NextGIS QGIS. Then you need to set access permissions for WFS service. See section Setting permissions. Resources could be joined to groups. For example you can join base layers to one group, satellite imagery to another group and thematic data to one more group etc. Groups help organize layers in Control panel and help manage access permissions in a convenient way. To create a resource group navigate to the group, where you want to create a new one (root group or another), and in actions pane “Create resource” click “Resource group” (see Pic. 2.47.). Create resource dialog for resource group is presented on Pic. 2.48.. In create resource dialog enter display name, that will be visible in administrator interface and in map layer tree, and then click “Create”. To create a lookup table navigate to the group, where you want to create it (root group or another), and in actions pane “Create resource” click “Lookup table” (see Pic. 2.49.). Create resource dialog for resource group is presented on Pic. 2.50.. In create resource dialog enter display name. Switch from “Resource” tab to “Lookup table” tab, which is presented on Pic. 2.51.. In opened window there are options “Add” and “Delete”. “Text” tab in a dropdown list of “Add” option allows to fill in lookup table data as “key” - “value” pairs. Then press “Save” button. The window will then look as on Pic. 2.52. With NextGIS Web application experience we recommend the following typical structure for organizing resources.